After a couple of weeks in Luang Prabang (see posts here and here) and Vientiane (reviewed here) in Laos, we took a short 90 minute Vietnam Airlines flight to Phnom Penh, to start our exploration of the Khmer Kingdom of Cambodia. Phnom Penh is the capital and largest city of Cambodia, located at the meeting point of the Mekong River and the Tonle Sap (a river in the wet season, a massive lake the rest of the year). 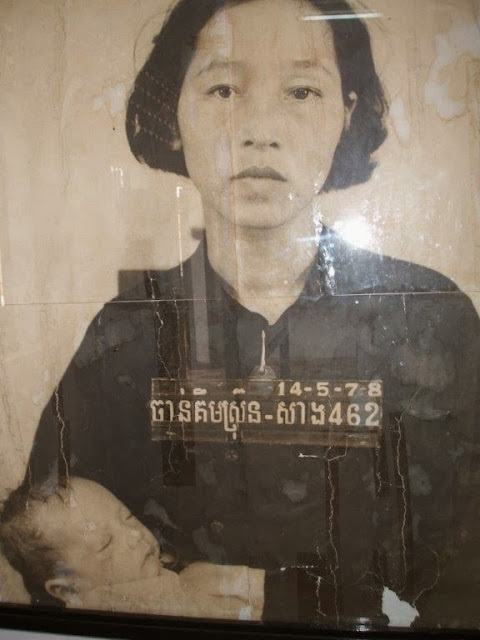 During the terrible years of Pol Pot in the mid-1970s, the capital was deliberately emptied of its entire civilian population who were sent to work in the fields as part of his 'permanent revolution' and anti-intellectual drive. Although Phnom Penh was liberated from the Khmer Rouge by the Vietnamese army in 1979, it has still to regain its former beauty (it was known as the Paris of the East before 1970), but we noticed a big improvement since our last visit in 2005. The riverfront, which has recently been planted with gardens and has a number of cafes and bars, is a good place to stroll along, take in the sights and for people watching. 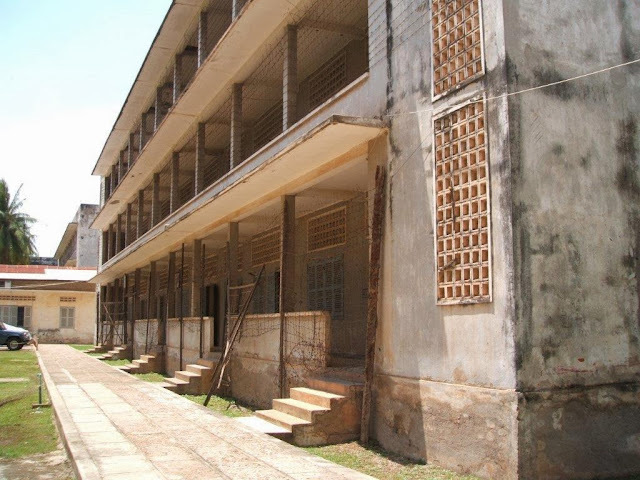 There are a number of interesting sites and markets to visit throughout the city centre, and it is both educational and moving to learn from some of the Khmer Rouge sites in and around the capital. There are a lot of new developments taking place in Phnom Penh, with new buildings and roads being built everywhere, the city has an exciting feel about it, a place where things are changing so fast that it’s almost palpable. Our introduction to customer service at the Raffles Hotel Le Royal was nothing short of exceptional. Inside Phnom Penh’s international airport, we were whisked away as soon as we set foot on the ground by one of the hotel’s concierges. He took care of our visas as we whizzed past long queues, with no awkward conversations taking place or time being wasted at immigration barriers. Our passports were returned to us before the luggage arrived at the belt, the most hassle free visa I can ever remember getting. It was a short, 30-minute drive by the hotel’s BMW limousine to the splendid Raffles Hotel Le Royal. Originally opened in 1929, it was designed by French architect Ernest Hérbert in a blend of Khmer, Art Deco and French colonial style to cater for the influx of wealthy visitors on their grand tours of the time. It still is Phnom Penh’s top luxury hotel, with many illustrious guests having stayed there over the years including Charlie Chaplin, Jackie Kennedy, and lately Barack Obama and Hillary Clinton. I loved the hotel’s original art deco features, the huge teak staircases against the elegant black and white tiled floors, the high ceilings and louvered shutters. Think Great Gatsby meets Indochina glamour for an idea of how beautiful is the Raffles Hotel Le Royal. Our room was the Angkor Suite, one of the four Landmark Suites in the original 1929 main building. It had two double bedrooms, a living room, a private balcony and three bathrooms. It was furnished with Khmer antiques blending into a French colonial design, oriental rugs on dark wood floors and many gorgeous Art Deco features including original bakelite light switches. The bathrooms were huge, one with a shower, the other with the original claw footed bath, white tiles and cool marble floors. This was an enormous suite of 140 square metres, and also one of the most stunning we have ever experienced. The Angkor Suite includes a personal 24 hour butler who was there to help us with everything we needed, including polishing our shoes, ironing our shirts for dinner, and booking our air tickets to Siem Reap. He also arranged all our transport around town and made our restaurant bookings. The hotel has a central courtyard with a large outdoor swimming pool, surrounded by a lush tropical garden with mature tall trees. There are two restaurants, a couple of bars, and a deli, in addition to the spa. We enjoyed having a few cocktails at the Elephant Bar, reputedly one of the most happening watering holes in town. As with other Raffles hotels around the world, the Phnom Penh location also has its own signature cocktail - Femme Fatale, a homage to Jackie Kennedy made from Champagne with a dash of strawberry liqueur. In addition to Le Royal Restaurant, the hotel’s fine dining option (See Where to Eat section below), Café Monivong is where breakfast and a more informal buffet lunch or dinner are also served. We loved the huge breakfast buffet each morning serving everything we could have wished for - cooked Asian and Western options, pancakes, waffles, cakes and myriad pastries - it was a feast to the eyes! I enjoyed a few plates of freshly cut fruit, a must-have in Asia where fruit is generally so sweet and flavoursome, and platefuls of stir-fried noodles, rice and chicken soup, dim sum, and Dr G’s favourite Eggs Benedict. 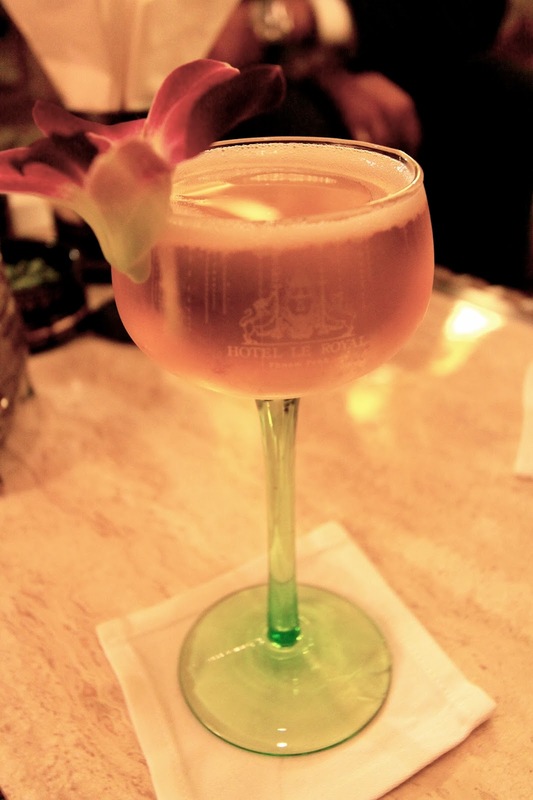 The Raffles Hotel Le Royal was one of the most wonderful hotels we have experienced. Its Art Deco grandeur and elegance, the comfortable rooms and top nosh we had were second to none. It was the service however that really made it for us. From the general manager, who was there to greet us when we arrived or to bid us farewell as we left at 6:30 in the morning a couple of days later, to the butlers, concierges and every other member of staff, the attention and care they showed to us were outstanding and made our stay a very special one. Traditional Khmer cuisine is one of the world’s oldest, and is considered by many to be the mother of all southeast Asian cooking. This is a country where seasonality and the use of local produce are not just fads but a fact of life in a place where virtually no food is imported. Fish from the Tonle Sap and the Mekong is abundant, and is used in its many forms - fresh, smoked, dried or fermented alongside myriad local herbs and vegetables. Rice is the nation’s staple food, and is eaten from breakfast to dinner, as a snack or an accompaniment to other dishes in a meal, or even as a dessert. The cuisine makes abundant use of fresh ingredients, a multitude of herbs, green leaves and fruit, counterbalanced by the salty taste of fish sauce, dried shrimp and Prahok. This is a fermented river fish paste, almost a national institution, used to flavour many dishes. Unlike its neighbouring countries, Cambodian food is not mind-blowingly hot, with a more predominant use of black pepper than red or green chillies. Kampot pepper from Cambodia is thought to be among the best and most aromatic in the world. Another important flavouring in Khmer cooking is Kroeung - a paste made from many ingredients blended in a mortar, including cardamom, star anise, cloves, cinnamon, nutmeg, ginger, fresh turmeric, lemongrass, galangal, garlic shallots, coriander and kaffir lime leaves. A typical meal would consist of soup, salad, a fish or meat course with vegetables and rice, often served simultaneously. Desserts are often based on fresh fruits and coconut. Malis was highly recommended to us as the top Khmer restaurant in town. It is headed by Luu Meng, a Cambodian chef who is garnering celebrity status in his hometown, particularly after filming with Gordon Ramsay for Gordon’s Great Escape, I suppose this should raised alarm bells! The menu is extensive but well designed and beautifully photographed. The dishes are presented under various headings like salad, curries, or desserts with detailed explanation to facilitate ordering. We asked the chef to prepare us a tasting menu of his choice with some of his signature dishes. We started with a deliciously refreshing green mango and smoked fish salad which had a number of different ingredients, flavours and textures - thinly shredded green mango and carrots, peanuts, deep fried crispy shallots, crunchy smoked fish, dried shrimps, sawtooth coriander and fresh chillies. We also enjoyed another green leaf and mint salad with small local scallops. It had local herbs including sawtooth coriander and fish leaves, thinly sliced snake beans, and bean sprouts, seasoned with a sweet and sour dressing. The salads were followed by a soup of paper thin slices of young bamboo shoots with smoked fish, sweetcorn, green leaves, and winter melon. It was a traditional Khmer soup with a delicious and highly concentrated clear broth. The main courses were the ubiquitous fish amok served in banana leaf, and accompanied by aubergine puree, and Prahok Ktis - a dish of fermented fish and minced pork flavoured with various ingredients including shallot, garlic, turmeric, palm sugar, coconut, galangal and chilli. The fish amok was unfortunately underwhelming and lacking in seasoning only rescued by the two other dishes, particularly the Prahok Ktis which was bursting with flavour and was utterly delicious. The wine list was limited and pricey, but we managed to find a bottle of De Bortoli Chardonnay 2012 for £17.30 from Australia. With a hint of oak, crisp and green, it was a suitable accompaniment to the food we sampled. Malis was one of the most expensive restaurants we experienced on this trip. We spent over £60 for a meal for 2 which in Cambodia is unheard of. We enjoyed the food at Malis although we are not sure the food was any better than at other establishments we tried at a much lower cost. It is a case of style over substance in my opinion. In addition to a cafe, two bars and a deli, the Raffles Hotel Le Royal is also host to Restaurant Le Royal, a fine dining venue serving Royal Khmer and modern French cuisines. Lately the hotel has been exploring menus offered to some of its more famous visitors from its heyday pre-1970. On our visit, after careful research, they were able to recreate the menu offered to Jackie Kennedy for her visit to Cambodia and Angkor Wat in 1967. If for no other reason, this offered a fascinating glimpse of what was considered French Haut Cuisine in the 1960s, and I was interested to give it a try. The menu can be enjoyed with a matching flight of French wines and a cocktail (Femme Fatale) as an aperitif. 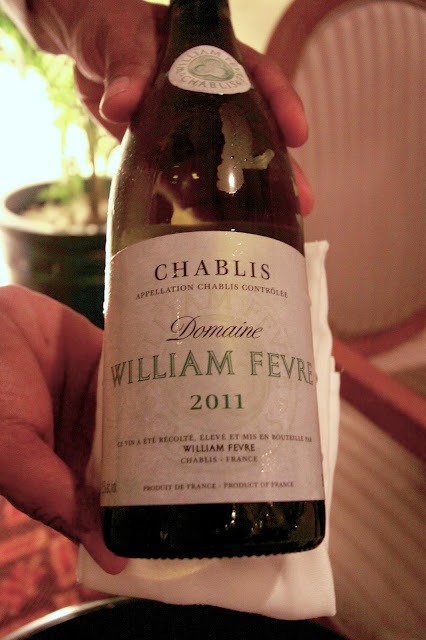 We started with a deliciously creamy chicken soup followed by a rissole (pastry case) of duck foie gras, both dishes washed down with a glass of 2011 Chablis William Fevre which we felt was a good match. We were then served a green leaf salad tossed in balsamic vinaigrette, with croutons and tapenade. For main course, we had a medallion of fillet of beef stuffed with wild mushrooms which was unbelievably tender, well cooked (medium rare just as I ordered) and very tasty. We had a glass of 2006 Saint Emilion Grand Cru, Chateau Croix Figeac which again was an excellent choice. For dessert, we all enjoyed creme caramel and a few crepes suzette cooked a la minute and served with a glass of 2010 Chateau Laulerie, Cote de Montravel. This was a delicious sweet wine made from Semillon grape from the Bergerac area. On the day we arrived, we had a light lunch at The Writers Bar, where afternoon tea is normally served. We enjoyed a beautifully made banana blossom and seafood salad and a few fresh spring rolls with prawns, both very expertly prepared and delicious. This market, like Raffles Le Royal Hotel, is an elegant building from the French colonial era in the 1930s, and is striking both from the inside and outside. The central domed area contains jewellers and clothing stalls, and the surrounding area is a more traditional local flower and food market, including restaurant stalls. It gives a good insight into local foods and customs. This school was converted into Cambodia's most important prison in 1975 when the country was being ruled by the brutal Khmer Rouge under the dictator Pol Pot. 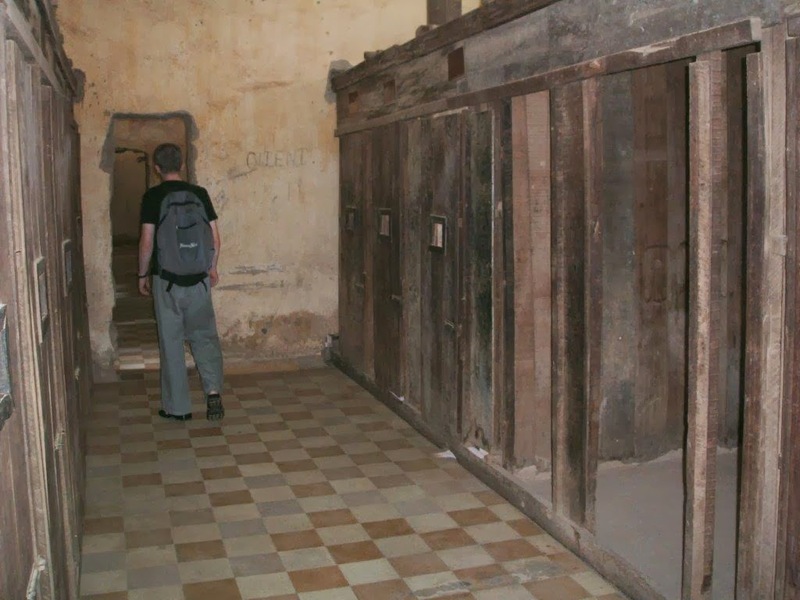 Over 14,000 people were tortured here before being killed either at the school or at the Killing Fields. Only 8 prisoners survived. The museum is sad but poignant, well set out, and very well worth a visit preferably before Choeung Ek. (17km south of Phnom Penh). Entry £3. This can be reached by tuktuk, taxi, or via any number of tour operators in town. A former Chinese cemetery, this is where the Khmer Rouge killed many thousands of Cambodians. There is an audio guide which helps make sense of the site, as well as a small museum, and a Buddhist stupa containing over 8,000 human skulls collected from the mass graves in the area. Room rates vary according to room type and seasonality. During our stay State Rooms were available from around £120. The larger suites may cost around £1,000 per night. For full rate details, please visit the Raffles Hotel Le Royal website. We flew with Vietnam Airways, which offers one-way flights from Vientiane to Phnom Penh for £100.